Sen. 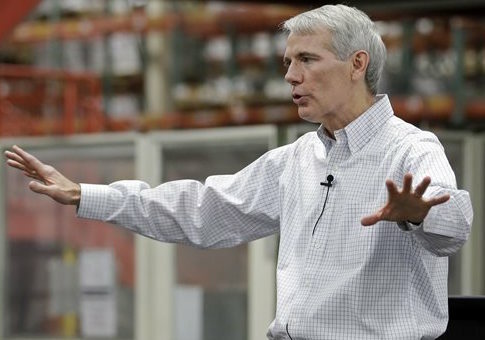 Rob Portman (R., Ohio) is demanding answers from the Department of Health and Human Services (HHS) on the causes and consequences of the failed Obamacare co-op program in Ohio. Portman, who chairs the Senate Permanent Subcommittee on Investigations, conducted an investigation into the co-ops and found that the government agency was aware of severe financial problems with the co-ops but awarded them loans anyway. The investigation found that 12 of the 23 co-ops had gone under, "leaving American taxpayers on the hook for up to $1.2 billion in unpaid loans and causing 740,000 people in 14 states to scramble to find new health coverage," the senator explained. "But despite receiving regular reports that the co-ops were performing far worse than expectations, HHS took no corrective action for over a year and neglected oversight of this multibillion-dollar portfolio." Since the senator’s investigation, the co-op serving his state, Ohio InHealth Mutual announced that it was going out of business, making it the 13th co-op out of 23 to fail. In a letter demanding answers to Acting Administrator of the Centers for Medicare and Medicaid Services Andy Slavitt, Portman wrote, "Ohio’s Obamacare co-op, InHealth Mutual, recently filed for liquidation—causing serious disruption and headaches for more than 22,000 Ohioans enrolled through InHealth." "Now they are scrambling to evaluate new coverage options and understand the risks of continuing coverage under InHealth," he wrote. "I am writing today to seek clear answers on behalf of these Ohioans." "These families—including 22,000 Ohioans enrolled in InHealth—were encouraged by the Administration to enroll in the Obamacare marketplace in the first place," he wrote. "Now they have to find new insurance or risk paying a penalty to the IRS. Worse, many of them have already paid high deductibles for their CO-OP coverage, yet they are about to lose credit for those payments and incur more out-of-pocket costs if they chose a new insurance plan mid-year. That’s just not fair, and the Administration owes these Ohio families a solution to a problem it created." This entry was posted in Issues and tagged Obamacare, Rob Portman. Bookmark the permalink.